Visitors to this site often ask, “Just what is F-Class, and how are the matches run?” Monte Milanuk, a regular on our Forum, has provided a practical explanation that is far more illuminating than the technical definition of F-Class found in the RuleBooks. Monte explained: “Since ‘TR’ may not mean much to you if you’ve never shot iron sights competitively, specifically in a Commonwealth country… lets try it like this. F-Class matches are all shot prone. No benches, no sitting, no standing, nothing but prone, as in laying on the ground. The matches are shot in a manner referred to as ‘slow fire’ (as opposed to ‘rapid fire’). Basically only one round in the gun at a time. Got a 30 round magazine? Fine, but you can only load one round at a time. The general idea is you shoot at a target on a fairly large frame, suspended in a sliding carrier, sticking up from behind a protective berm. After the shot goes thru the target, someone in the ‘pits’ pulls the target down, puts a shot spotter (plastic or cardboard disk w/ a spindle) in the hole, puts a paster over any previous shot holes, marks the value of the shot, and runs it back up. 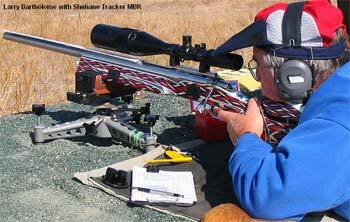 The reason for the value marker is because at distances of 600-1000yds, it’s very difficult, even with the best of optics, to tell if a shot is on one side of a scoring line or another. The spotter disk tells you where the shot went, the value marker tells you what the actual score for that shot was. At this point is where we run into the difference between ‘pair fire’, which is what they do in Canada, Britain, and other countries, and ‘string fire’, which is what we predominately shoot here in the U.S.A. In pair fire, you have two (or more) shooters to a firing point, alternately shooting and scoring for one another. This makes it functionally almost impossible to ‘machine gun’ a string and get off a large number of shots in one wind condition — you simply have to learn to read the wind, take your best calculated guess, and let fly. In string fire, you can shoot again as soon as the target comes back up, over and over and over. You have a ‘block’ of time, say 22 minutes for 2 sighters and 20 record shots, and you can use 3 minutes, or you can use 21 minutes 59 seconds. At any rate, you shoot usually three or four ‘strings’ of 15-20 shots. They might all be at one distance (say, 600yds), or you may have to change yard lines between each string (800, 900, 1000yds). There are two basic classes or categories in F-Class. There is ‘Open’ class, which is fairly wide-open still. 10kg (22 lbs.) weight limit, max .35 caliber, 3″ wide fore-end, and no one-piece rests or rear mechanical rests. 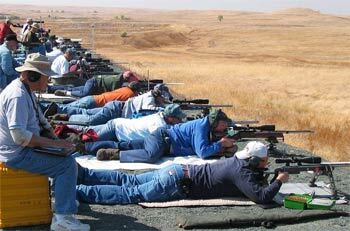 And then there is ‘Target Rifle’ class, aka F/TR. A slightly lower weight limit (8.25kg, roughly 18.15 lbs. ), caliber restricted to .223 Rem or .308 Winchester, and you have to use either a bipod or a sling, both of which are included in the overall weight limit! The majority of shooters seem to be migrating initially to F/Open (about 75-80%), and the remainder are in F/TR. Unfortunately, this means that at a lot of smaller local matches a lone F/TR shooter will likely get lumped in w/ the F/Open shooters. Share the post "What is "F-Class"? — A Practical Definition"
This should interest varminters looking for a harder-hitting rimfire round with better ballistics and accuracy. The most common .22 Winchester Magnum Rimfire (WMR) ammunition features a 40gr round nose or flat point bullet with a Muzzle Velocity of about 1910 fps. All the major makers — CCI, Federal, Remington, and Winchester — sell 40gr ammo loaded to this specification. Hornady’s new 22 WMR offers a more accurate bullet traveling faster — roughly 300 fps faster to be precise. The new Hornady round features a 30gr V-MAX™ bullet leaving the muzzle at 2,200 fps. 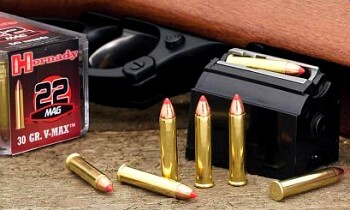 The new 30gr Hornady 22 WMR ammo should be available in “early February” according to Hornady. While the new Hornady 22 WMR offers significantly better ballistics than a typical 40gr, 22 WMR load, other ammo makers do offer similar high-speed 22 WMR loadings. Both CCI Maxi-Mag +V and Federal V-Shok ammunition push a 30gr HP bullet at a claimed 2200 fps. But the Hornady round, with its higher-BC, V-MAX™ bullet, should maintain a velocity edge downrange, as less speed is lost to aerodynamic drag. We think the potential is there for even better accuracy, perhaps even half-MOA in a match barrel, but unfortunately Hornady decided to short-load the ammo, pushing the 30gr bullets well inside the case. Bad move. As a result the case crimp is right on the ogive (and with production variances, the crimp may actually be forward of max bullet diameter). Given the shape of the bullet, which curves aggressively away from the case mouth, there’s no way you can get the seated bullet to touch the rifling, even with a zero-freebore match chamber. This was a deliberate decision on Hornady’s part, but we still wish the ammo was loaded longer — even just a little bit, to ensure that the ammo is crimped on the full-diameter bearing surface. We have seen examples of 17 Mach 2 and 17 HMR rounds with crimps forward of max bullet diameter and this kills accuracy while causing problems such as mangled case mouths and canted bullets with extreme run-out. 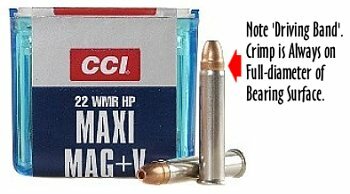 Compare the CCI Maxi-Mag +V shown above. It has a distinct driving band. This ensures that the crimp is on the full diameter of the bullet. We would like to see Hornady load its new 30gr 22 WMR longer to ensure that the crimps are ALWAYS on the bearing surface, and NEVER on the ogive. If Hornady is already at SAMMI max Cartridge OAL of 1.350″, it could modify the plastic bullet-tip to allow the bullet to be moved further out of the case. Share the post "New 2200 FPS .22 Mag Rimfire from Hornady"